Mahmud, S., Taniguchi, J. (2012). Ultra-Sharpening of Diamond Stylus by 500 eV O+/O2 + Ion Beam Machining without Facet and Ripple Formation. International Journal of Nanoscience and Nanotechnology, 8(3), 127-134. S. F. Mahmud; J. Taniguchi. "Ultra-Sharpening of Diamond Stylus by 500 eV O+/O2 + Ion Beam Machining without Facet and Ripple Formation". International Journal of Nanoscience and Nanotechnology, 8, 3, 2012, 127-134. Mahmud, S., Taniguchi, J. (2012). 'Ultra-Sharpening of Diamond Stylus by 500 eV O+/O2 + Ion Beam Machining without Facet and Ripple Formation', International Journal of Nanoscience and Nanotechnology, 8(3), pp. 127-134. Mahmud, S., Taniguchi, J. Ultra-Sharpening of Diamond Stylus by 500 eV O+/O2 + Ion Beam Machining without Facet and Ripple Formation. 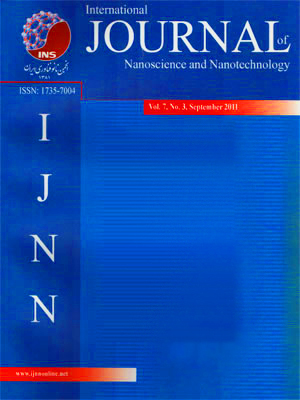 International Journal of Nanoscience and Nanotechnology, 2012; 8(3): 127-134. The price of single point diamond tools with a sharp tip is very high due to complex machining process and highly expensive machining equipments. Yet, the performance is not quite satisfactory. In this paper, we have presented a very simple and cost effective machining process for the sharpening and polishing of diamond stylus using low energy reactive ion beam machining (RIBM). In our method, machining of the stylus was done by 500 eV O+/O2 + ion beam at an off-normal ion incidence angle under rotating condition. Mechanically coarse-finished styli of two different size and shape were used as the specimen- stylus of apex angle 90° with the radius of curvature 5μm and stylus of apex angle 60° with the radius of curvature 2μm. In both cases, the stylus was sharpened down to an apex angle of around 55° with the radius of curvature ≤100 nm. The tilt angle of the specimen for shrapening was predicted from simulation. The surface of the processed stylus was completely smooth and ripple-free and the surface defects on the pristine stylus were also eliminated by the proposed machining method. Due to low energy RIBM, the irradiation damage on the diamond crystalline structure was minimal.